MS Family Medicine Health Care, P. C. (Rosedale) - Book Appointment Online! 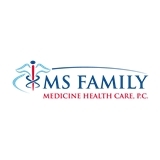 MS Family Medicine Health Care, P. C.
Welcome to MS Family Medicine Health Care, P. C. providing. "Quality health care for the entire family". Proudly serving the Queens and Long Island communities since 2002. MS Family Medicine a group practice of Primary Care Physicians, comprised of Family Physicians, Pediatrics Physicians, and Nurse Practitioners. Each MS Family facility has a board certified physician and dedicated staff focused on providing comprehensive heath care and maintaining your health. Including stabilizing symptoms for acute and chronic illnesses. Including but not limited to: Family Medicine, Pediatric Medicine, Women's health and coordinated disease management programs. Dr. Reed was very helpful in explaining my lab results, and how to best go about staying healthy with excellent lifestyle and behavior choices that will optimize my health.